Your affiliate program is designed to bring additional traffic, customers and sales to your store. The affiliates are created and managed from Marketing > Affiliates. For the exact details - click here. This section will show you a filter for all of your affiliates and their activity from date to date. 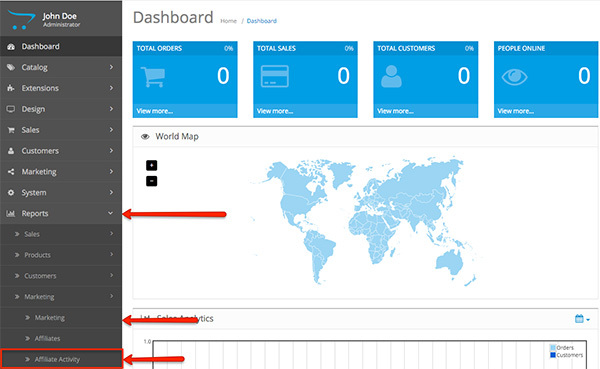 You are able to see the name of each affiliate, their IP address and their type of activity on each date. To track their activity, your affiliate will need to create an account in your website. 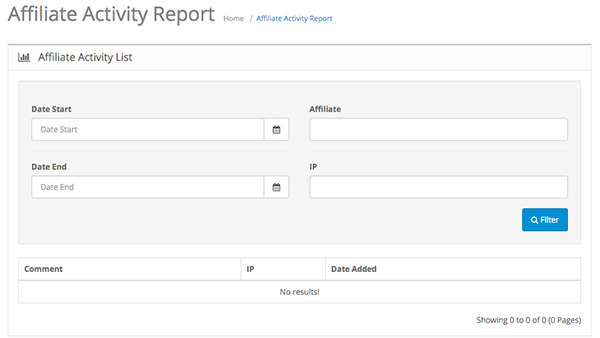 The Affiliate Activity Report will indicate their transactions, when they logged in, etc. Affiliate: The name of your affiliate. IP: The IP address used by your affiliate. Comment: The type of activity of your affiliate. For example: John Doe logged in.